During my research on colored diamonds, I ran across a story on the Hope Diamond and could not stop reading! As a jeweler with over 30 years of experience, I spend most of my time now researching and writing about jewelry. There are few stories that can draw attention like the History of this Blue Diamond. Facts about Diamonds say that this famous Diamond is a 45.52 carat, deep-blue diamond that is now housed in the Smithsonian National Museum of National History in Washington D.C. However, among the fancy coloured diamonds, the Hope is no ordinary blue colored diamond, as it has a long and interesting history and is famous for carrying a supposed 'curse' that dates back hundreds of years. This blue diamond looks suspiciously similar to the fictional blue diamond - "Heart of the Ocean" worn in the Titanic movie by actress, Kate Winslet, who played the part of a beautiful female Passenger on the Titanic sinking. The first known version of the Diamond was a triangular-shaped 115 carat stone known as the Tavernier Blue diamond, named after French merchant Jean-Baptiste Tavernier – the man who first brought the gem to Europe. The Tavernier Blue diamond was one of several stones that Jean-Baptitste Tavernier sold to Louis XIV in 1669, and was believed to have been discovered by the merchant during his travels in India during the preceding few years. Louis XIV kept the Tavernier Blue in its original form until 1678, when he commissioned court jeweler Sieur Pitau to re-cut the stone. The resultant 69 carat gem was set on a cravat pin, and known as the Blue Diamond of the Crown, or the French Blue. The French Blue stayed within the family, and in 1749 King Louis XV had it set in an elaborate jeweled pendant for the Order of the Golden Fleece. The first trouble with the diamond occurred during the time of the French Revolution, when in 1792 a group of thieves broke into the Garde-Meuble (the Royal Storehouse) and stole the vast majority of the crown jewels, including the French Blue. Though some of the other stolen items were recovered at a later date, the French Blue was never found, and had appeared to have disappeared, never to return again. There have been many suggestions and stories as to what has happened to the French Blue after its disappearance. A leading theory suggests that one of the thieves took the stolen jewels to London, where it was cut into two and sold. It has also been suggested that it has been re-cut to disguise its identity. Twenty years after the theft of the French Blue (which coincidentally with the amount of time after which the statute of limitations for the crime expired), a blue diamond of the same size, shape and color was discovered in the possession of Daniel Eliason, a London-based diamond merchant. This is the first definitive record of a stone that was later to be known as the Hope Diamond. What happened to this stone over the following 27 years is not entirely clear – though it is believed it may have been acquired by King George IV at some point in the 1820’s,before being sold on again after his death in 1830. In 1839 the diamond reappeared in a catalogue of the gem collection (which included the Hope Pearl) of Henry Philip Hope, set in a medallion and surrounded by a number of smaller white diamonds. Just a short time after the publication of his catalogue, Henry Philip Hope died, the collection was divided amongst his family, and the Hope Diamond became the possession of Henry Thomas Hope, the oldest nephew of the Henry Philip Hope. The Hope Diamond was put on display at the Great Exhibition of London in 1851 and the Paris Exhibition of 1855, but outside of these events was safely stored away in a bank vault. Henry Thomas Hope died in 1862 and his wife Anne Adele Hope inherited in the diamond. Following Anne Adele’s death in 1884, the Hope Diamond passed on to their younger son, Henry Francis, who later became Lord Francis Hope. Lord Francis Hope led a profligate lifestyle, and towards the end of the 19th century was struggling with debt. In 1901 he was forced to sell the diamond for £29,000 to Adolph Weil, a London-based jewel merchant. The gem changed hands several times over the following decade, eventually ending up in the possession of Pierre Cartier - a member of the famous Cartier family of jewelers. After re-setting the diamond, Pierre Cartier sold the stone to U.S. socialite Evalyn Walsh McLean, who wore it almost religiously at social occasions until her death in 1947. Her jewels were then sold to settle her debts, and the diamond continued its epic journey, becoming the property of Harry Winston, a New York-based diamond merchant, who eventually donated it to the Smithsonian Institution in 1958. On February 9, 2005, the Smithsonian announced that a year-long research program on the gem had confirmed that it was indeed originally part of the French Blue diamond. The almost unbelievable history of the Hope Diamond is only part of the story. The diamond is also believed to carry a curse with it, which has long been the focal point of many stories and myths over the years after a number of deaths and unfortunate incidents involving the diamond’s owners. Perhaps the most famous legend is that the original origin of the diamond was that it was stolen in India by Jean-Baptiste Tavernier from the eye of a sculpture of Sita, a Hindu Goddess and the wife of Rama. After Tavernier had sold the diamond to Louis XIV, he continued his travels into Russia – where he was torn apart by wild dogs. A few decades later, future owner Louis XV not only had the diamond stolen by thieves, but was also beheaded (along with his wife Marie Antoinette) during the French Revolution. After the reappearance of the (now) Hope Diamond, the curse seemed to continue. Many of its owners passed away just a few short years after taking possession of the stone, including King George IV, who was believed to have taken ownership during the 1820’s and died in 1830, laden with debt. Henry Philip Hope then died just a few months after cataloguing the stone, and the once-rich Hope Family eventually went bankrupt – with many people blaming the curse of the Hope Diamond for this spectacular fall from grace. Evalyn Walsh McLean was believed to have purchased the diamond for its bad luck – as she claimed that items of supposed bad luck were actually good luck for her. Unfortunately for Ms Walsh McLean, her son died in a car crash at age nine, her daughter committed suicide at the age 25, and her husband was declared insane and died in a mental institution in 1941. After Evalyn herself died in 1947, the diamond had to be sold off to help repay her debts. 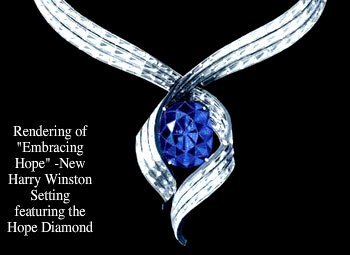 It is also often claimed that purchaser Harry Winston donated the Hope Diamond to the Smithsonian Institute to rid himself of the curse, and to confine it to the safety of a museum display case forever. The diamond has an intense blue color and has something of a special aura that draws visitors to marvel at it, proved by the fact that it has remained the most popular jewel on display in the Smithsonian’s National Museum of Natural History since its donation. Now weighing in at 45.52 carats, the gem is from this month (September 2009) to be exhibited as a stand-alone piece with no setting, so visitors can fully appreciate the true brilliance and wonderful history of the Hope Diamond. Mike has written for several websites and is a 30 year veteran of the jewelry business. Mike lives in Michigan with his wife, two sons and a wonderful Weimaraner. 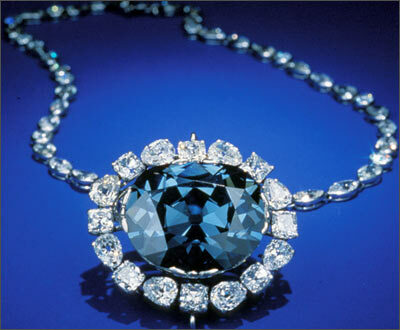 In 1958 Harry Winston donated the Hope Diamond to the Smithsonian as a "gift to the American people." The famous blue diamond was set by Cartier in 1910. The diamond is currently on display at the Smithsonian, and the new Harry Winston setting featuring the Hope (was to be presented in November 2008). The new setting was called "Embracing Hope" and was chosen from three potential designs.